Pierre Casiraghi is the grandson of fashion icon Grace Kelly, the American movie star-turned princess. Image courtesy of Paramount Publicity/Creative Commons. Casiraghi is an avid sportsman, but he especially loves sailing. Image courtesy of Jonathan Glynn-Smith. Pacha III, the family’s classic 1936 Camper & Nicholsons yacht. The Prince's Palace, Monaco. Image of courtesy of Shutterstock. 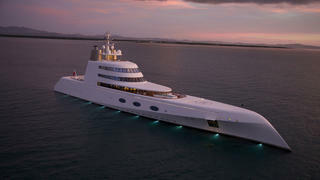 Casiraghi admires the unique design of Andrey Melnichenko’s Motor Yacht A.
Monaco is a very small place with one very big family. The Grimaldis have ruled here since 1297, stewarding the principality through a dramatic evolution from sleepy fishing port to the wealthiest two square kilometres on planet Earth. Few other royal dynasties can boast such a transformative legacy as this – nor one of the 20th century’s greatest love stories. It’s a rich history, but not one that appears to weigh too heavily on the shoulders of Pierre Casiraghi, son of Princess Caroline and Stefano Casiraghi and grandson of Grace Kelly and Prince Rainier III, as he sits on the terrace of the Hôtel Hermitage polishing off a “very fine” bottle of red. But that doesn’t mean he wants to talk about it. When our conversation veers too closely to what it’s like being royal in a principality whose population barely touches 40,000, he withdraws a little, disappearing behind a half smile and narrowed eyes. His answers come slower, after a pause. Fortunately, it doesn’t take long to crack the code. When we get onto sailing, he’s forward again in his chair, with no filter. He works more behind the scenes now, in close collaboration with friend and famed ocean sailor Boris Herrmann. The pair competed in the GC32 class together and in 2017 took on the Fastnet in an IMOCA 60. In 2020 Herrmann, competing as Team Malizia, will take part in the Vendée Globe, the single-handed, non-stop race around the world. Casiraghi and team are working with 15 schools across Europe on an educational programme that will allow children to follow the yacht and learn about the different ecosystems encountered along the way, wrapping in ocean conservation and biodiversity. “Using the boat, the teachers can speak about the different continents and different wildlife in the ocean, and emphasise how to protect it. There’s a whole list of things they can learn, and they each get a paper model of the boat that they have to build. Each kid gets one and then we try to keep an update throughout the race so they can follow the boat and get involved. He prefers the classics, and likes to spend time on board Pacha III, the family’s 36 metre Camper & Nicholsons motor yacht built in 1936. “You’re right on the water and you feel like you’re on a boat, so you know why you’re going.” He understands the modern vogue for explorer yachts – “at least they have a purpose and can sail in big sea conditions” – and harbours an ambition to build his own yacht. “I have it all in my head,” he says. “I know exactly what I would do.” But will he tell me? “I can’t. It terrifies me that someone would build it.” He does reveal that it will be a motor yacht and based on a model from the 1930s that he saw – and now owns. “It will be about 30 or 35 metres, so not big, and it will have classic style but it will also be a modern, elegant boat.” I press for more details, but it’s no use. He’s sitting back in his seat, hiding behind that half smile and those narrowed eyes.